Okay okay… enough with the neon pink already right? I just can’t help it. Neons are my all time favorite this summer, and I cannot wait to transition them to fall. You can’t go wrong with a neon beanie or button up under a sweater. There’s just something about a pop of color I love so dearly. 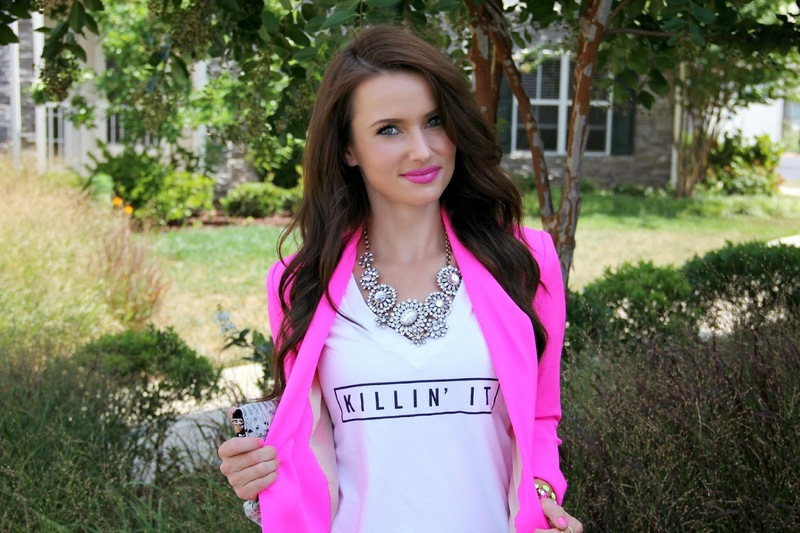 Oh, and this “killin it” tee from Style Lately is my go to for fall transition. It’s simple, stylish, and can be paired with a blazer or jacket to give your outfit a finished, and ready for fall look! Anyway, Happy Friday! I leave Tennessee tomorrow to head back HOME! Yes, that’s right. Tomorrow night I will be back in our home in Utah, sleeping in my own bed and probably chasing the kids around the house (considering we’ve been cooped up in an apartment for the last four months). I can’t wait to finally be home! Cayman starts pre-school this year, and is signed up for soccer this fall. It’s going to be a blast! Here’s to a new season (almost) and a new wardrobe! I can’t wait! Cute look- I love how the blazer, nails and lips all match, and those heels are killer! Happy weekend! You should definitely keep wearing the hot pink. You can rock it! Such a cute look. Hope you have a safe trip back to Utah! 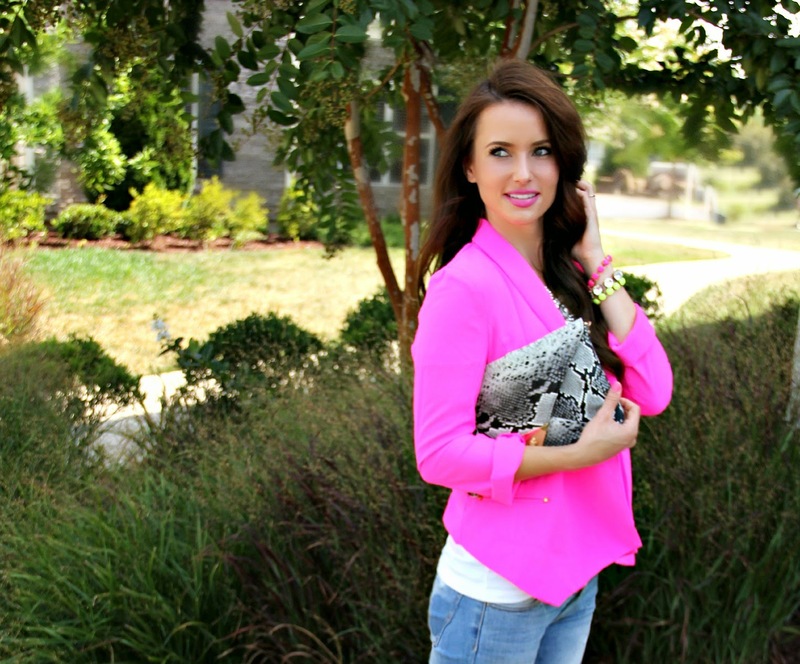 I've got the neon pink thing going on today too:) Love it! I LOVE how you styled your statement tee! I recently posted on my blog about different ways to style a statement tee–I would love if you popped by for a look! Love this outfit! 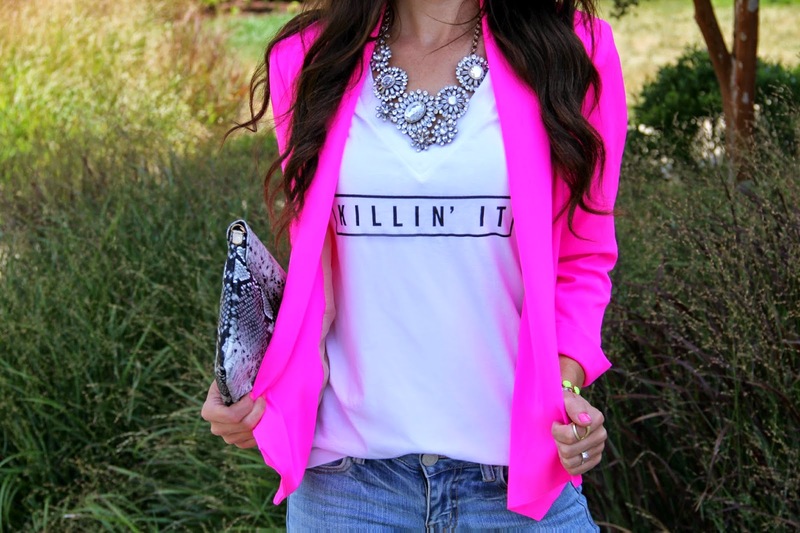 The distressed denim looks amazing with that statement tee and neon blazer, and the statement necklace is so sparkly and pretty! So gorgeous! Loving that tee! Never too much neon!! Love it! !